David Holland (sometimes recorded as Hollands) was born in Gloucester on 1st September 1887, the son of a waterman. The family then lived at 6, Mercy Place, Southgate Street, Gloucester. By 1901, they had moved to 1, Bath Buildings, Stroud Road, Gloucester, and 13 year old Dave was working as a driller in an ironworks. Dave learned his rugby at that invaluable nursery, the Gordon League club, as a back row forward. He first played for the City club when turning out for Gloucester A against Cinderford A on 3rd March 1906. Gloucester won 38-3, and Dave made a sufficiently good impression to remain in the side for the remaining eight matches of that season, scoring 3 tries in the process. He graduated into senior rugby with Gloucester in the 1906-07 season, making his first appearance on 20th October 1906 against Cheltenham at Kingsholm. Unfortunately this was the match in which Cheltenham recorded their first ever victory at Kingsholm, 3-0. Dave had to wait until 5th January 1907 for his second appearance in the first team, an 11-6 win at Clifton. Dave figured in nine matches for the premier City side in that first season, whilst still playing at least seven games for the United team as well. He created a favourable impression, and in his summary of the season, WB wrote in the Citizen: “ D Hollands also deserves special mention, being the most promising reserve promoted from the Seconds”. For the next three seasons his place as a regular member of the side was assured. In 1907-08, he played in 31 out of the 34 matches on the fixture list. He scored five tries, his first two at particularly important times, since they were the only tries in narrow wins over Cinderford 9-5 (which was his first try for Gloucester on 30th September 1907 at Kingsholm), and Leicester 8-6; he also scored in the 6-0 victory over Bristol, in the 11-0 win against Cheltenham, and in the final match of the season when Bristol were again defeated, 14-3. It is a measure of how quickly Dave Hollands made his mark, that he was selected for the County in their first match of the season – Glamorgan 14 Gloucestershire 13 on 16th October 1907. He retained his place for five of the County’s six fixtures that season, playing in the victories over Devon and Somerset and the losses to Cornwall in both group and play-off matches. He missed out on selection for Gloucestershire in the County Championship this season, but he did play, and score a try, for the Gloucestershire team which defeated Racing Club de France, 39-0, at Kingsholm on 24th December 1908. In 1909-10, Dave was almost ever-present in the Gloucester side, playing in 34 of the 38 fixtures. The side had a fine season winning 23 and losing 8 of their matches. Dave himself registered the highest try tally of his career with 7 – he scored against Clifton, Lydney and Plymouth, and two tries each against Old Merchant Taylors and the 2nd Glo’sters. In the penultimate game of the season, on 16th April 1910, he kicked the only conversion of his career against Leicester in a 14-0 win – a farewell gesture. The last game of the season, and Dave’s final appearance for Gloucester, was the County Cup Final on 23rd April 1910, which Gloucester won 18-0 against Lydney, as a result of which they were presented with the cup and individual medals by the President of the County Football Union, Mr C E Brown. As regards the County in 1909-10, Dave did not play in the warm-up game against Glamorgan or the South-West group games, but came into the team when Gloucestershire had to replay against Somerset (won 16-8 at Kingsholm on 20th January 1910) and Cornwall (won 12-11 at Redruth on 3rd February, with Dave scoring the winning try). The County then had to travel to Blackheath to take on Kent in the semi-final on 23rd February, when Dave scored Gloucestershire’s only try in a narrow 6-3 win. He was then included amongst the seven Gloucester players selected for the Gloucestershire team which won the County Championship for the first time by defeating Yorkshire in the final at Kingsholm on 9th April 1910, by 4 goals, 1 try (23 pts) to nil. Gloucestershire had a brilliant team that year, and the record in the championship games was: played 7, won 6, lost 1, points for 108, against 59. At the Gloucester Football Club AGM , gold medals and photographs of the Gloucestershire team were presented to the City players who took part in the final, but Dave had already left for Devonport, so his were sent on to him. Dave thus finished his Gloucestershire career with ten caps, three tries and a County Championship winners medal. However, to the great regret of Gloucester and Gloucestershire supporters, this highly successful season was Dave’s last for both Club and County. He finished his Gloucester career with 97 appearances, 16 tries, one conversion, and 50 points scored. But Dave’s football honours did not end there. He later went north and signed on for Oldham to play Rugby League. Continued success marked his career in the professional game, and he had the further and coveted distinction of being chosen a member of the Great Britain League team to tour Australia. As John Robinson, Willie Hall and A E Wood (former Gloucester players) were also in the touring party, the City was exceptionally well represented. Dave Holland, as with the great majority of Gloucester footballers, did his bit in the first Great War, seeing service with the Royal Navy. He served in HMS Colossus, stationed at Scapa Flow, the crew of which, with Dave to the fore, won the Navy Rugby Championship. He also played for the Devonport Services team, a strong combination of Rugby Union and Rugby League players, amongst whom were Arthur Hudson and Fred Pegler of Gloucester. In January 1918, Dave returned to Gloucester with Hudson and Pegler to play for the Royal Naval Division against Gloucester – as for most of his playing career, Dave again ended up on the winning side. Dave’s cousin, John Welshman also played for Gloucester, making 3 appearances in 1906-07. Although the late Mr. David Holland (whose death occurred on Thursday) had only four years service with the Gloucester Rugby team, he attained a reputation which earned for him a high place among the many brilliant players who have worn the famous cherry and white jersey, writes W.B. It is 40 years since Holland first appeared for the City under the captaincy of D. R. Gent, migrating into senior football from that invaluable nursery, the Gordon League Club, which organisation we all hope will be in full running again next season. “Dave” (as our old friend was popularly known) figured in nine matches for Gloucester in 1906-7, and created such a favourable impression that for the next three years his place as a regular member of the side was assured. In addition to gaining his City Cap, he obtained County honours (ten appearances altogether), and in 1909-10 he was included in the Gloucestershire team which won the championship by defeating Yorkshire, at Kingsholm, by 4 goals 1 try (23 points) to nil. Gloucestershire had a brilliant team that year, and the record in the championship games was: played 7 – won 6, lost 1; points for 108, against 59. But to the great regret of the local football public that season finished Holland’s career with Gloucester. Securing employment at Devonport he threw in his lot with Devonport Albion, thus following the example of two former Gloucester players – Walter George and W. Spiers. 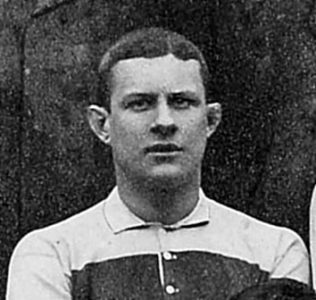 Holland‘s reputation had preceded him to Devonport and with his new club he continued his outstanding work as a back row forward. Few players in my long experience could excel “Dave” in skill, judgement and cleverness, and he was, without question, one of the finest attacking forwards of his time. This was clearly emphasised by the fact that he was honoured by the England selectors to play in all three international matches (Wales, Ireland and Scotland) in 1911-12. Devon County also utilised his valuable services. But Holland’s football honours did not end there. Later he went North and signed on for Oldham in the Rugby League. Continued success marked his career in the professional game, and he had the further and coveted distinction of being chosen a member of the League team to tour Australia on one occasion. As Willie Hall and A. E. Wood (former Gloucester players) were also in the chosen partly the City was exceptionally well represented. Dave Holland, as with the great majority of Gloucester footballers, did his “bit” in the first Great War, seeing service with the Royal Navy. He served in H.M.S. Colossus, the crew of which (including “our Dave”), won the Navy Rugby Championship. He also assisted the Devonport Services team, a strong combination of Rugby Union and Rugby League players, amongst whom were Arthur Hudson and Fred Pegler (Gloucester). Dave played alongside my great uncle Billy Hall at both Gloster and then at Oldham and then for England’s tour of Australia and New Zealand - both were in the legendary ‘Rourkes Drift’ test where we beat Australia to win the Rugby League ’Ashes’ in 1914 just prior to the outbreak of WW1.